A native of Dublin, OH, Dr. Hutchins was initially drawn to dentistry because it allows her to enhance her patients’ health, appearance, and confidence all at the same time, which is pretty rare for any medical field! She loves that she gets to meet new patients every day and help them achieve their dental goals. She can’t wait to get to know you, but first, you can learn more about her below! Dr. Hutchins graduated from The Ohio State University with a bachelor’s degree in finance with a minor in Spanish. She eventually earned her dental degree from the UCSF School of Dentistry in San Francisco. Afterward, she completed a comprehensive, 12-month Advanced Education in General Dentistry residency at the South Texas Veterans Health Care System in San Antonio. 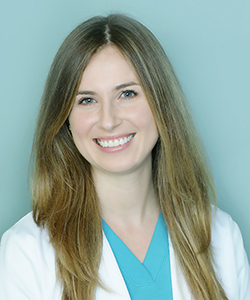 Her residency focused on the surgical placement and restoration of implants, gum and bone grafts, root canals, advanced crown and bridge treatments, esthetic dentistry, TMD therapy, sleep medicine, Invisalign®, and IV sedation. Dr. Hutchins is a proud member of the American Dental Association and Omicron Kappa Upsilon National Honor Dental Society. Dr. Hutchins happily married Kris in 2017, and they currently reside in Grandview with their dog, Hermione, and cat, Leo. She enjoys exercising, baking, traveling, and spending time with her family and friends.